No matter where you live, you probably don’t have to go far to see one of the members of the swallow family. These graceful, aerodynamic birds are quite familiar to most people. If you spend much time at all outdoors during the summer months, chances are you’ve observed some members of this family. Overall, it’s been a good year for swallows. It’s usually not too difficult to find five of the six species that are known to make Northeast Tennessee and Southwest Virginia their home from spring to fall. In addition to barn and tree swallows, I have seen purple martins, cliff swallows and northern rough-winged swallows so far this year. 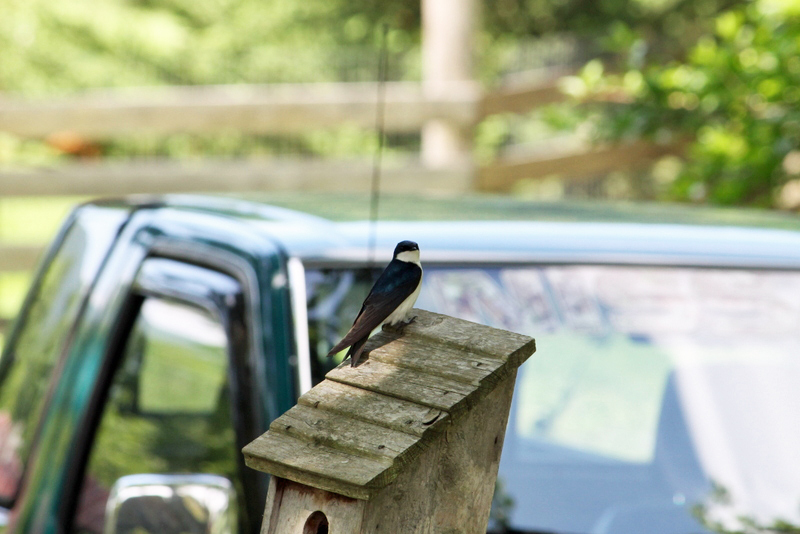 A tree swallow peeks inside a nest box at the Beierle home. Barn swallow and tree swallow are the two members of the family that are probably best known to people. They have adapted to life in both suburban and rural areas, which brings them into frequent contact with people. These days, the barn swallow is as apt to nest in a parking garage or on an apartment balcony as inside a barn in the countryside. Once young swallows leave the nest, parents will park them on a perch as they continue to feed the still dependent young. Adults fly over nearby fields, foraging for insects that they catch on the wing and deliver back to the waiting, always hungry, young birds. A freshly mown field is a magnet for swallows. I don’t know how the word spreads so quickly among these birds, but I’ve observed dozens of these birds descending on fields soon after they have been mowed for hay. At times, the birds arrive while the mowing is still taking place, swooping after insects stirred up in the tractor’s wake. I haven’t observed any bank swallows in the region this year, but these members of the swallow family are rather hit-or-miss in the region. Because of their specialized nesting needs, bank swallows are localized in their distribution and not as widespread as their kin. Cliff swallows nest beneath many local bridges. These swallows, which at one time nested primarily on rocky cliffs, hence their name, now frequently nest under man-made structures. These swallows make their jug-shaped nests out of mud and clay. These nesting “jugs” are all located in clusters beneath bridges and other structures. It’s a wonder that the parents flying in with food are able to tell their nests apart from the nearby seemingly identical nests of their neighbors. Photo by Bryan Stevens For such a small bird, the Northern rough-winged Swallow has a long name. Northern rough-winged swallows are opportunists when it comes to nesting. According to a profile written by Mark Johns with North Carolina Wesleyan College, this small swallow nests near rocky gorges, shale banks, stony road cuts, railroad embankments, gravel pits, eroded margins of streams and other exposed banks of clay, sand or gravel. They will also nest in old kingfisher burrows, protruding drainpipes, crevices in brick or stone structures such as dams, bridges or tunnels, gutters and culverts. Their nests are often built near open water. 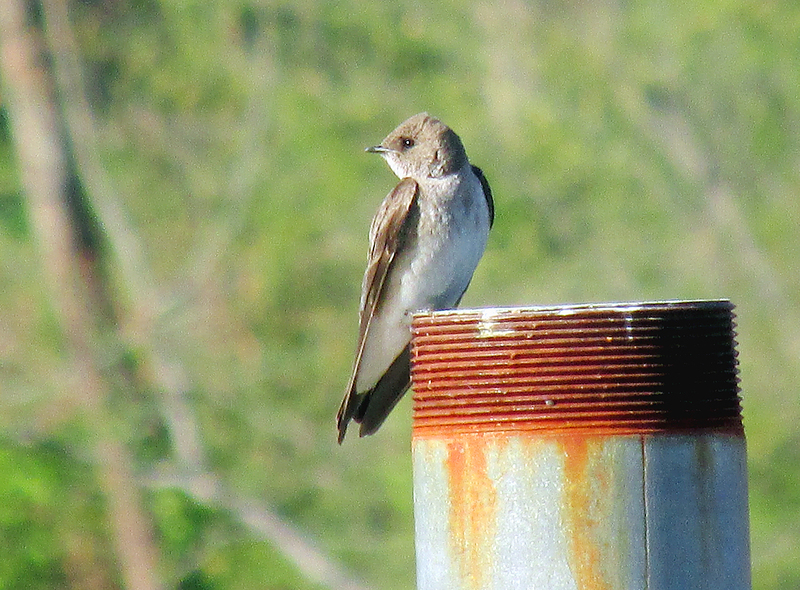 The Northern rough-winged swallow ranks as one of the species with the longest common names in North America. It’s name consists of 26 letters and a hyphen, which ranks it one letter below both the Northern beardless-tyrannulet and a recently-created species — the saltmarsh sharp-tailed sparrow — which each have 27 letters and a hyphen. 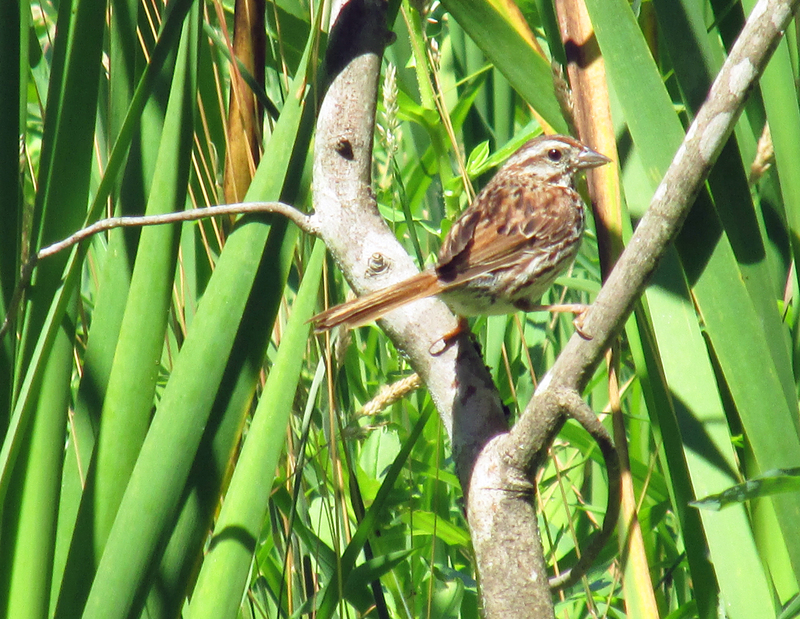 Formerly known as sharp-tailed sparrow, the species was renamed with “salt marsh” added to distinguish it from a relative, Nelson’s sparrow. Photo courtesy of Mary Taylor Beierle A male Tree Swallow surveys his territory from atop a nesting box. Purple martins, which rank as the largest species in the swallow family in North America, are famous for nesting in large colonies. Nesting facilities range from groupings of natural or artificial gourds fashioned into a nesting chamber, as well as large, multi-level condominium dwellings tailored for the specific needs of this communal bird. A colony can consist of several dozen to several hundred pairs of these birds. Only the adult male purple martin shows the iridescent, dark blue-purple plumage that provides the species with its name. The tree swallow is my favorite, probably because a pair of these birds has nested in my yard for many years. Unlike other swallows, these cavity-nesting birds will readily accept nesting boxes. They compete with Eastern bluebirds for boxes, but the two species usually can work out a truce and settle down to nest in close proximity to each other. The iridescent blue-green male tree swallow, complete with white underparts and a forked tail, is a handsome bird and a welcome addition to the bird population in any yard or garden. Tree swallows enjoy water, so a nearby pond or creek is a boon for attracting these birds. 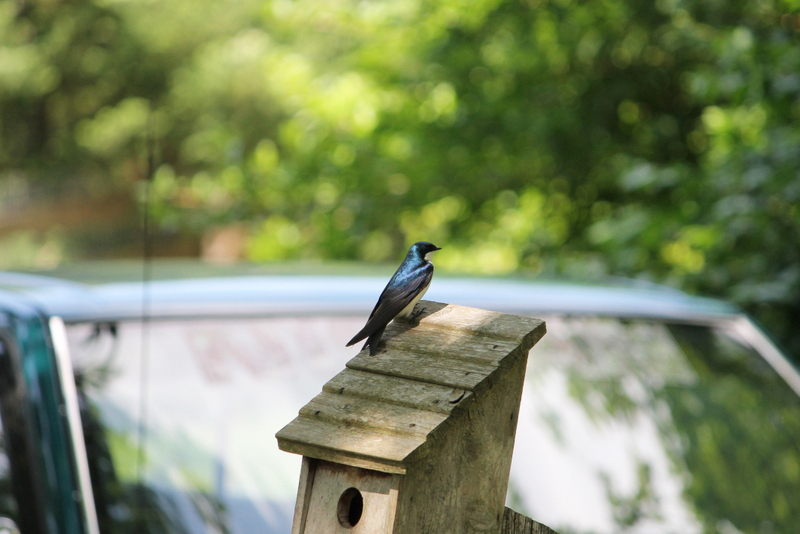 Photo courtesy of Mary Taylor Beierle Tree swallows readily accept human-provided nesting boxes. They also make delightful neighbors during the summer season. While only a few swallows range into the United States and Canada, a total of 83 species of swallows can be found worldwide. Some of the common names for these different swallows (and martins) are quite descriptive. A sampling includes white-eyed river martin, square-tailed saw-wing, white-headed saw-wing, grey-rumped swallow, white-backed swallow, banded martin, violet-green swallow, golden swallow, brown-chested martin, brown-bellied swallow, pale-footed swallow, white-bibbed swallow, pearl-breasted swallow, greater striped swallow, mosque swallow, fairy martin and chestnut-collared swallow. Several of the photos this week were provided by Mary Taylor Beierle, a resident of Stoney Creek in Carter County. Mary is also the author of the book, “Edmond The Daddy Turkey,” a delightful story about a male turkey who learns how to be a father. Photo by Bryan Stevens A Barn Swallow perches on a utility wire over a field. 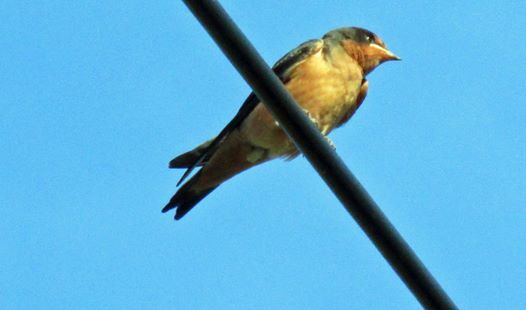 This entry was posted in Birds, Carter County Compass and tagged Barn Swallow, Bristol Herald Courier, Carter County Compass, Cliff Swallow, Elizabethton Star, Erwin Record, Northeast Tennessee, Northern Rough-winged Swallow, Purple Martin, Summer birds, Swallows, Tree Swallow on July 27, 2014 by Bryan Stevens. 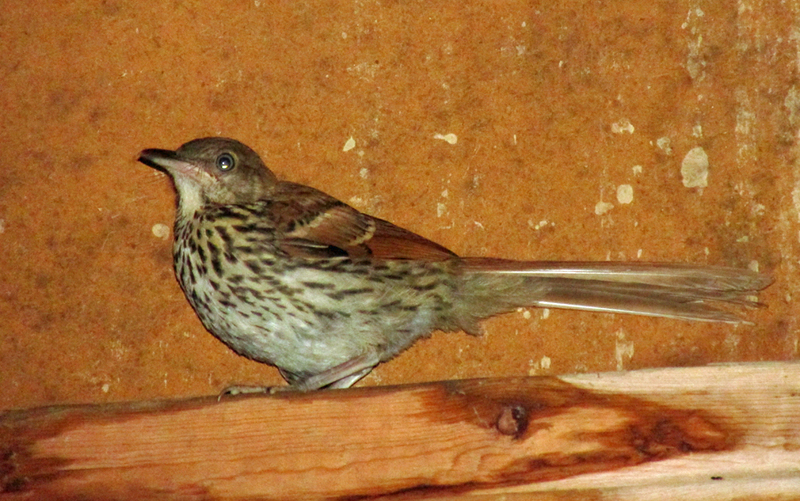 A fledgling Brown Thrasher perches on a ledge inside a garage. It’s been a banner year for brown thrashers at my home. In recent weeks, these large songbirds have provided plenty of entertainment by bringing their young to the feeders. They especially like the suet feeder. The parent birds work to detach chunks of suet. Once they secure these morsels, the parents feed their hungry young. A Brown Thrasher scans the grass for insect prey. A few years ago, quite by accident, I came across a brown thrasher nest. I hadn’t gone looking for it. The nest, expertly woven into a thicket of honeysuckle vines, was tucked beneath a sheltering eave of an outdoor storage building. I don’t think anything but a fortunate accident could have ever revealed the nest. I still remember peeking into that tangle of vines and seeing a golden eye staring back. The bird didn’t look in the least pleased that I had accidentally stumbled across her nest. The otherwise extroverted brown thrasher, which prefers to nest in difficult-to-access, tangled messes, found the cluster of vines a perfect location. I haven’t discovered any thrasher nests this year, but I’ve observed several fledglings when they began visiting the feeders with their parents. For those not familiar with brown thrashers — relatives of the Northern mockingbird — they are known for their feisty and fearless protection of their nest and young. Brown Thrashers prefer thickets and brushy areas that offer security for these somewhat shy birds. The brown thrasher (Toxostoma rufum) belongs to the family of “mimic thrushes,” which provides a label for a group of songbirds capable of imitating the songs of other birds. Mimidae, the Latin root for “mimic,” provides the scientific name for the family, which includes mockingbirds and the New World catbirds, as well as thrashers. The Northern mockingbird is best known for the ability to mimic, but relatives like the gray catbird and brown thrasher are also talented mimics. The thrasher is a fairly large songbird about 11.5 inches long with a wingspan of 13 inches. Much of the body length comes from the bird’s long tail feathers. A thrasher weighs, however, only about 2.5 ounces. 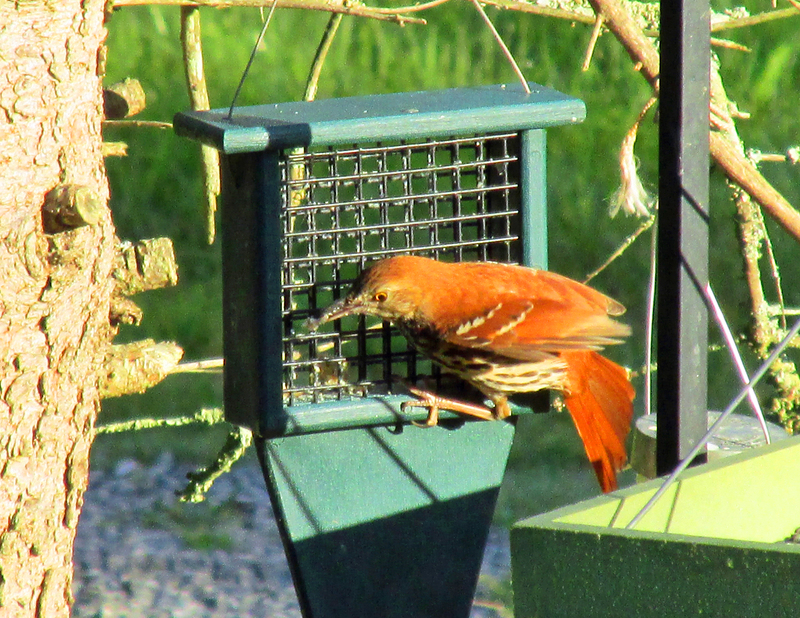 The brown thrasher is not a picky eater. It’s known to eat everything from berries and nuts to insects and small lizards. It’s also aggressive in defending its nest and young. 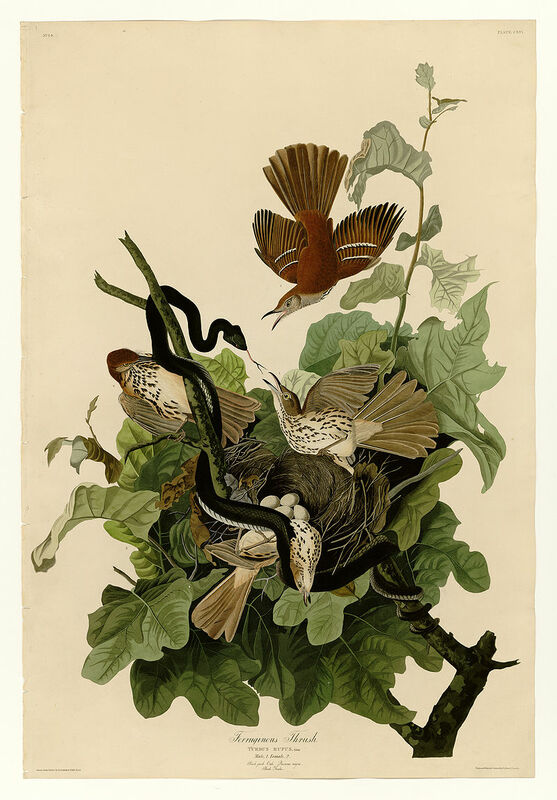 John James Audubon, a French-American ornithologist, naturalist and painter, painted quite a dramatic scene of a group of brown thrashers valiantly defending a nest from an attacking snake. The painting is so detailed that you have to imagine Audubon based his work on a real-life experience. His work, originally painted in the early decades of the 1800s, still holds up today. Early American naturalist and artist John James Audubon painted a dramatic scene of Brown Thrashers defending their nest from an attacking snake. This brown thrasher breeds across the United States and Canada east of the Rocky Mountains. Thrashers withdraw from the northern part of their range in the winter months, spending the season in the southeastern United States. They are familiar birds in southern gardens. 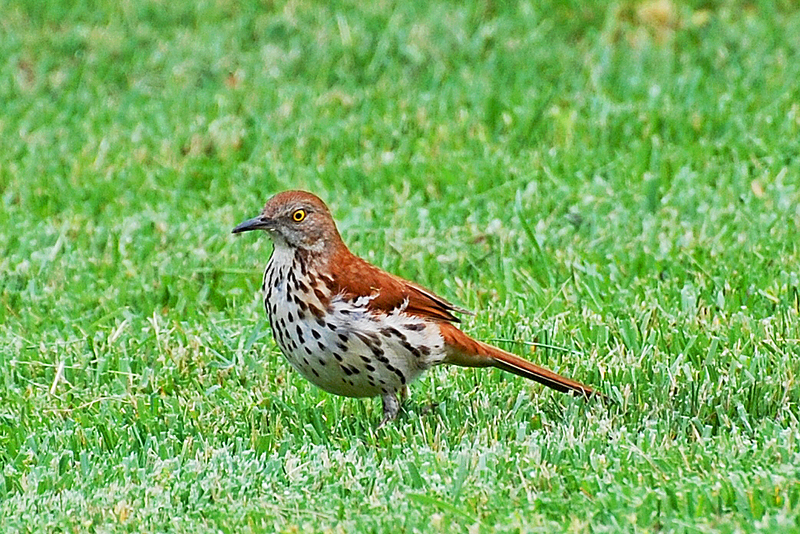 In fact, the brown thrasher is the official state bird of Georgia and also provided the name for Atlanta’s National Hockey League team, the Atlanta Thrashers. The thrasher became Georgia’s state bird due to passage of a Joint Resolution of the Georgia General Assembly in 1970. The brown thrasher is the only member of the thrasher clan in the eastern United States. In Texas and the western half of the country, however, there are several other species of thrasher, including sage thrasher, long-billed thrasher, Crissal thrasher, curve-billed thrasher, Bendire’s thrasher, California thrasher and Le Conte’s thrasher. Many of these thrashers also occur in Mexico. 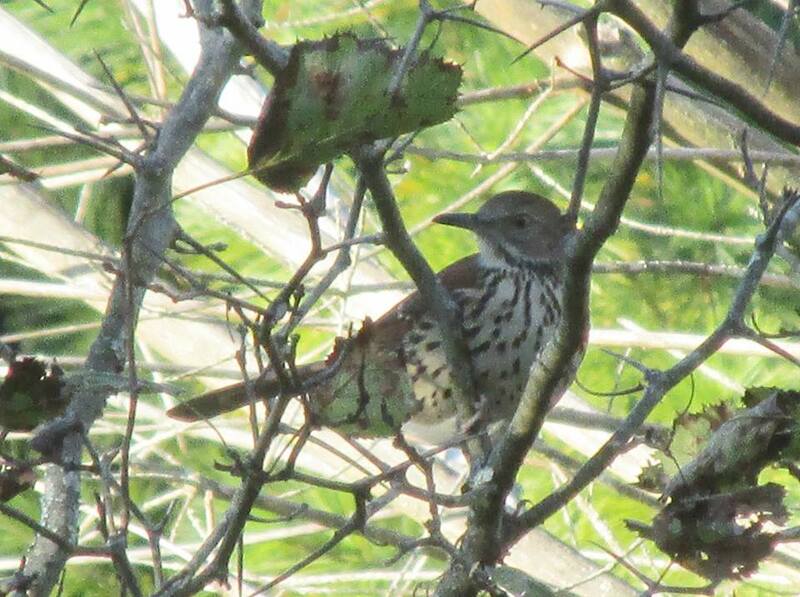 These New World birds also occur in the Caribbean, including such species as White-breasted Thrasher, Pearly-eyed Thrasher and Scaly-breasted Thrasher. 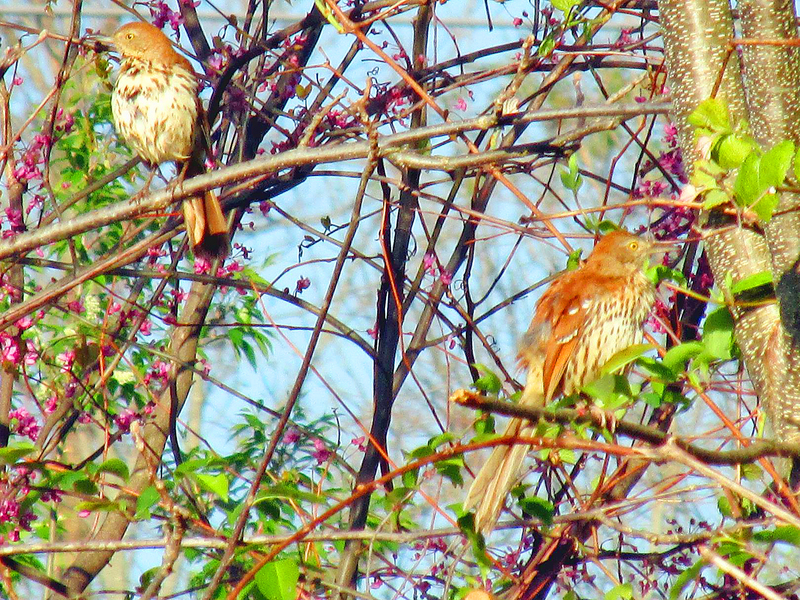 A pair of Brown Thrashers perch near a fence at Tipton-Haynes Historic Site in Johnson City. Rebecca Howe, who resides in Kent, Ohio, has sent me an email. She has recently been seeing young birds arriving at her feeding station. I thanked Rebecca for sharing about her rose-breasted grosbeak observations in a follow-up email and informed her that different birds depart at different times to go south for the winter. Some birds do not get into a rush to reach their destination, so the start of migration is more of a slow-paced, casual “wandering” that takes them to different locations in a more or less southern direction. Photo by Bryan Stevens Brown Thrasher visits a suet feeder. The thrasher diet consists of everything from berries and seeds to insects and even small reptiles. Closer to Southwest Virginia and Northeast Tennessee, birds like yellow warbler, Louisiana waterthrush and a few others are known to depart as early as July and August. Ruby-throated hummingbirds are another good example of slow migrants. Those that pushed to the northern limit of their range are probably already heading back. But they are very nomadic. Maybe they could even be described as “restless,” and it is this time of year when I start to get the highest numbers of these little birds. 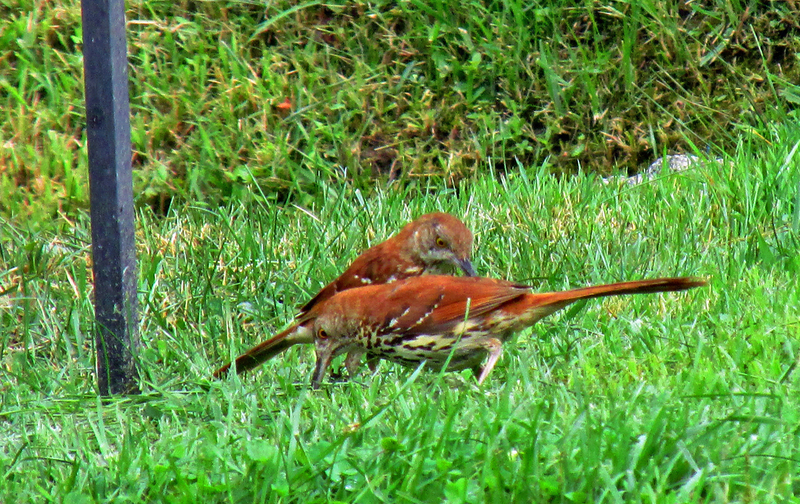 A pair of Brown Thrashers forage for food on the ground below a feeder. This entry was posted in Birding, Birds and tagged Birding, birds, Bristol Herald Courier, Brown Thrasher, Elizabethton Star, Erwin Record, Feathered Friends, Kent Ohio, State birds, Thrasher, Toxostoma rufum on July 20, 2014 by Bryan Stevens. I received a recent email from Flag Pond reader Amanda Austwick with the header, “Bird Feeders Damaged.” I get calls and emails about lots of unusual feeder visitors, but this one sort of stood out from the rest. In the email, I was asked if I had any idea what would attack a bird feeder in late afternoon in June? The damage to the feeders wasn’t minimal. “One feeder was completely bent over on the ground,” she wrote. At the time of the incident, there hadn’t been any rain. As a result, the animal that attacked the feeders left no prints. I responded to the email with the belief that the animal responsible for the damage was likely a Black Bear. Photo Courtesy of Amanda Austwick This bear caused considerable damage to the Austwick feeders. I also pointed out that the bear is actually just feeding on the seed. The damage is a by-product caused by the fact they probably don’t know their own strength. “I know you will miss your birds, but it would probably be best to stop feeding for a couple of weeks,” I informed Amanda. I suggested that after the two-week hiatus on feeding the birds that she put the feeders back outdoors but arrange to take them inside during the night. “I know this first incident took place during the day, but bears are still most often going to visit during the night,” I wrote to her. Unfortunately, the bear returned before she received my email response. The animal caused even more damage to the feeders, which she was able to document with photographs. A photo that she also emailed to The Erwin Record was even featured on the newspaper’s front page a couple of weeks ago. Photo Courtesy of Amanda Austwick This Black Bear became a daytime visitor at the Austwick home. There are ways to discourage such visits. By making the feeders absent for a time and then limiting the availability of the bird seed to daylight hours, perhaps this bear will lose interest and move on. Unfortunately, the attempt to deal with the problem came too late to prevent the bear from causing some property damage. Residents in Flag Pond and other locations in Unicoi County are certainly not the only people that have to contend with bears. Every year the Tennessee Wildlife Resources Agency receives hundreds of calls and complaints concerning black bears. According to TWRA’s website, most of the complaints involve bears raiding garbage containers and bird feeders, as well as feeding on pet food left outdoors. The website also makes clear it is not TWRA policy to routinely trap and move bears causing these types of problems. According to experts with TWRA, the long-term solution to bears raiding garbage containers, bird feeders and pet food left outdoors is to simply remove the food source and bears most often will go elsewhere. The website even notes that some people even intentionally feed bears. As often happens, even the best of intentions can go awry. As a result of the improper storage of garbage, easy availability of bird seed and the direct feeding of bears, animals often become habituated to humans and become a nuisance and a threat to human safety. Sadly, according to TWRA officials, there are no other alternatives but to destroy bears that become a threat to human safety. The agency spent hundreds of man-hours last year addressing bear-human conflicts and some bears had to be destroyed as a result of irresponsible behavior of people directly and indirectly feeding bears. 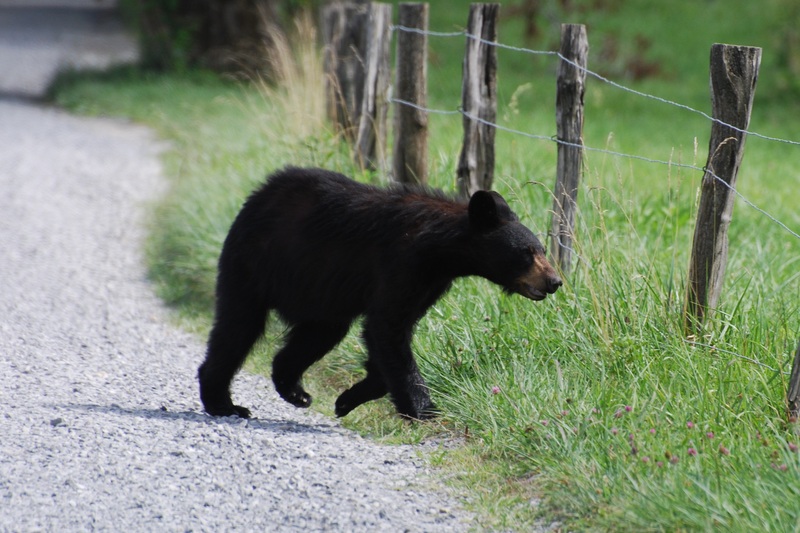 A Black Bear cub photographed at Cades Cove. • Keep cooking grills clean and stored indoors when not in use. • Do not feed birds between April and January when bears are most active. I don’t agree, however, with this moratorium. 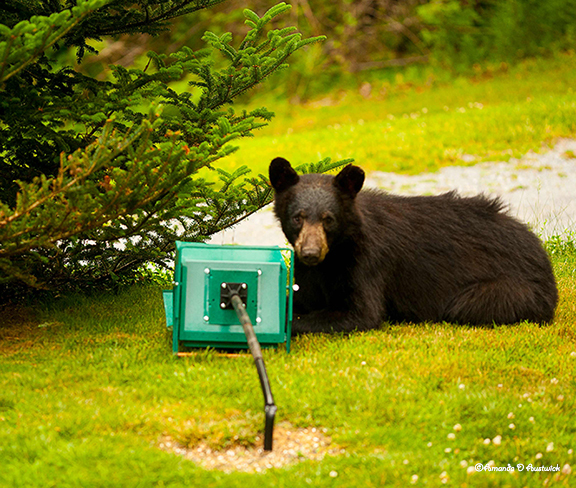 Feeders can be bear-proofed, although it requires effort and expense. I also think that feeders can be taken indoors at night to reduce the chance of attracting bears. I will concede that a determined bear willing to visit feeders during the daylight hours may require that all feeding of birds be curtailed, at least until the animal decides to move to greener pastures. 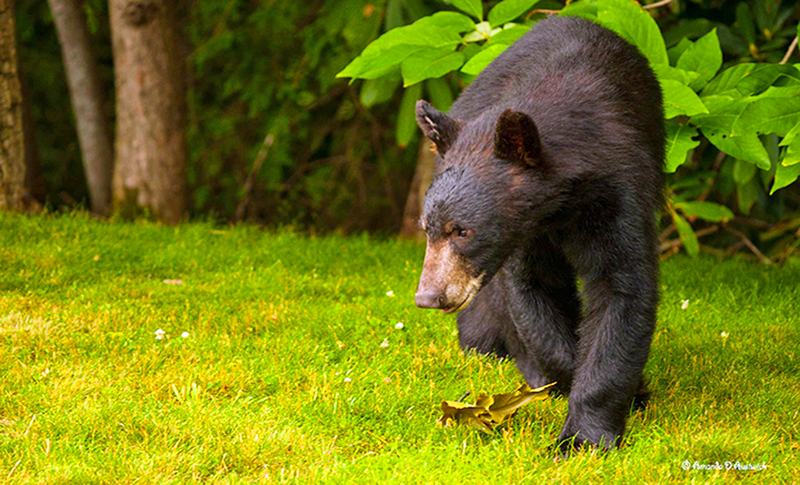 Black Bears (Ursus americanus) are one of Tennessee’s states treasures. Bears mostly inhabit Blount, Carter, Cocke, Greene, Jefferson, Johnson, Monroe, Polk, Sevier, Sullivan, Unicoi and Washington counties along the eastern border of the state. The highest densities of bears reside in the Cherokee National Forest and the Great Smokey National Park. Since the 1970s, the number of bears has significantly increased in Tennessee, according to TWRA. For example, prior to 1980, the annual harvest in the state was usually less than 20 bears. Today the picture could not be more astounding. Since 2004, Tennessee’s annual bear harvest has exceeded 300 animals! In 2009, a harvest of 571 bears in Tennessee set a new state record. American black bear at Great Dismal Swamp National Wildlife Refuge in Virginia. 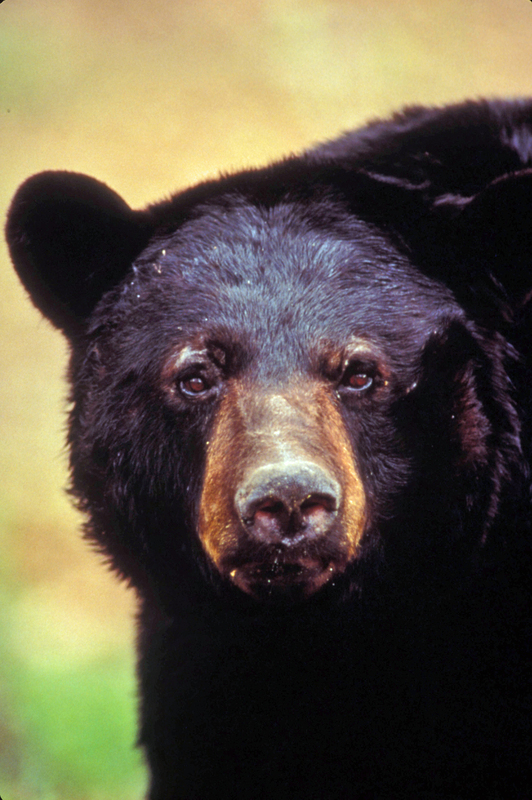 A key first step to rebuilding Tennessee’s bear population was the establishment of national forests and parks that shelter and protect Tennessee’s sparse bear population. With careful management and enforcement by TWRA and ecological conditions in their favor, bear populations have responded dramatically. Tennessee’s bear population thrives today largely due to the dedication of the TWRA, CNF, GSMNP, the bear research program at University of Tennessee and the support of Tennessee sportsman license dollars. Today Tennessee’s wildlife, forest and park service agencies confront new and difficult challenges in managing bear-human conflicts. As human and bear populations increase, and more people move near public lands, bear-human interactions have undoubtedly increased creating potentially dangerous situations for the public and for bears. TWRA maintains that the primary corrective action to this management dilemma is to simply restrict the access bears have to human foods. Tennessee residents and visitors can support bears by taking steps to ensure that wild bears remain “wild,” by carefully managing sources of human food or garbage that might attract bears. I’ve had neighbors, too, who have observed bears on their property recently. A few of them have even gotten photographs of the bears. I haven’t seen a bear on my property, but many years ago a bear left prints (and damaged some plants) in my grandfather’s tobacco plot. More recently, I’ve found droppings that I am fairly confident were left by a bear. The bears aren’t going anywhere, so we will probably be encountering them more often. 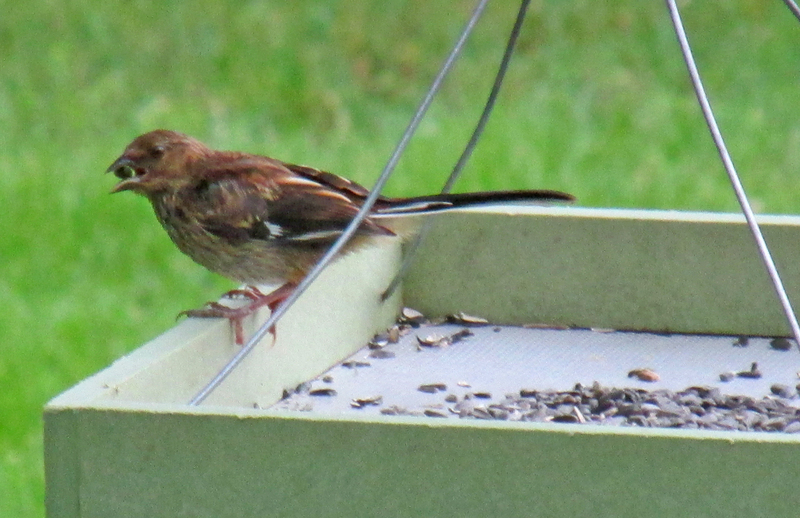 A young Eastern Towhee visits a feeder in July. The chance to see young birds is a great reason to offer food during the summer, but some precautions should be taken to minimize uninvited guests. This entry was posted in Birding, Birds, Carter County Compass, Elizabethton Star, Erwin Record and tagged Bears, Bears damaging feeders, Bird feeder pests, Bird feeding, birds, Black bears, Summer bird feeding on July 13, 2014 by Bryan Stevens. Members of the Lee and Lois Herndon Chapter of Tennessee Ornithological Society, known less formally as the Elizabethton Bird Club, conducted the 21st annual Carter County Summer Bird Count on Saturday, June 7. A total of 231 Song Sparrows, such as the one pictured here, were found during the recent Summer Bird Count. The 19 observers in six parties logged 58 party hours, plus 5.5 nocturnal party hours. The total of 116 species tallied was slightly above the average of 112. The range for this count has varied between 105 and 121 species. Observers included Jim Anderson, Rob Armistead, Kevin Brooks, J.G. and Deb Campbell, Harry Lee Farthing, Don Holt, Christy Kendall, Rick Knight, Roy Knispel, Joe McGuiness, Tom McNeil, Cathy Myers, Kathy Noblet, Chris Soto, Bryan Stevens, Kim Stroud, Mary Anna Wheat and John Whinery. Canada Goose, 379; Wood Duck, 11; Mallard, 74; Ruffed Grouse, 6; Wild Turkey, 9; Double-crested Cormorant, 1; Great Blue Heron, 25; and Yellow-crowned Night-Heron, 3. Black Vulture, 4; Turkey Vulture, 60; Sharp-shinned Hawk, 2; Cooper’s Hawk, 1; Broad-winged Hawk, 4; Red-tailed Hawk, 4; and American Kestrel, 6. Killdeer, 6; American Woodcock, 1; Rock Pigeon, 67; Mourning Dove, 111; and Yellow-billed Cuckoo, 1. Eastern Screech-Owl, 3; Barred Owl, 3; Common Nighthawk, 1; Chuck-will’s-widow, 2; and Eastern Whip-poor-will, 13. Chimney Swift, 96; Ruby-throated Hummingbird, 30; Belted Kingfisher, 7; Red-bellied Woodpecker, 15; Yellow-bellied Sapsucker, 1; Downy Woodpecker, 21; Hairy Woodpecker, 6; Northern Flicker, 22; and Pileated Woodpecker, 11. 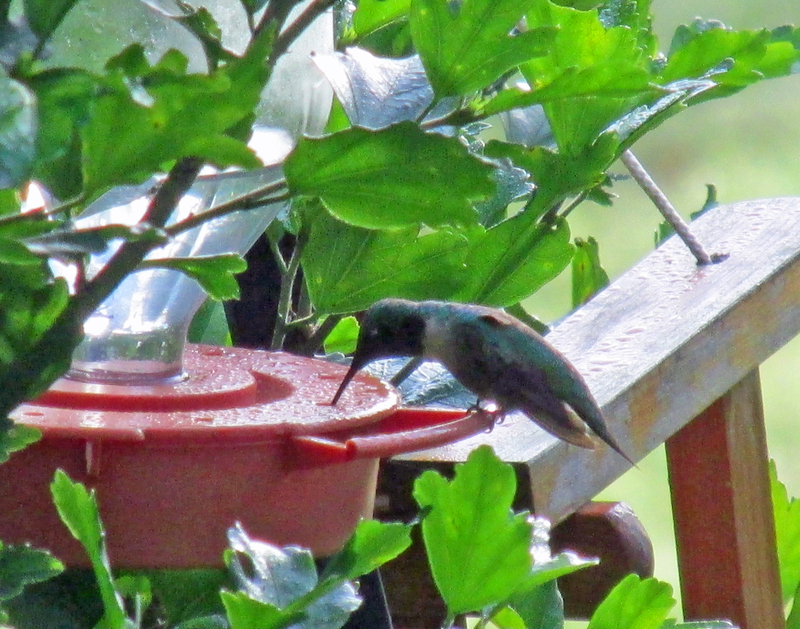 The Ruby-throated Hummingbird was represented by a total of 30 individuals on the recent Summer Bird Count. Eastern Wood-Pewee, 26; Acadian Flycatcher, 44; Alder Flycatcher, 4; Least Flycatcher, 9; Eastern Phoebe, 38; Great Crested Flycatcher, 4; and Eastern Kingbird, 17. White-eyed Vireo, 10; Yellow-throated Vireo, 2; Blue-headed Vireo, 54; Red-eyed Vireo, 166; Blue Jay, 91; American Crow, 130; and Common Raven, 6. Purple Martin, 21; Tree Swallow, 152; Northern Rough-winged Swallow, 36; Cliff Swallow, 295; and Barn Swallow, 159. Carolina Chickadee, 71; Tufted Titmouse, 72; Red-breasted Nuthatch, 9; White-breasted Nuthatch, 15; Brown Creeper, 1; Carolina Wren, 86; House Wren, 54; and Winter Wren, 8. Blue-gray Gnatcatcher, 41; Golden-crowned Kinglet, 10; Eastern Bluebird, 48; Veery, 31; Hermit Thrush, 2; Wood Thrush, 56; American Robin, 356; Gray Catbird, 44; N. Mockingbird, 59; Brown Thrasher, 16; European Starling, 607; and Cedar Waxwing, 94. Ovenbird, 70; Worm-eating Warbler, 14; Louisiana Waterthrush, 4; Golden-winged Warbler, 3; Black-and-white Warbler, 38; Swainson’s Warbler, 3; Kentucky Warbler, 1; Common Yellowthroat, 27; Hooded Warbler, 88; American Redstart, 9; Northern Parula, 15; Magnolia Warbler, 2; Blackburnian Warbler, 14; Yellow Warbler, 5; Chestnut-sided Warbler, 27; Black-throated Blue Warbler, 35; Pine Warbler, 4; Yellow-rumped Warbler, 1; Yellow-throated Warbler, 13; Black-throated Green Warbler, 34; Canada Warbler, 24; and Yellow-breasted Chat, 10. Eastern Towhee, 120; Chipping Sparrow, 100; Field Sparrow, 37; Vesper Sparrow, 1; Song Sparrow, 231; Dark-eyed Junco, 89; Scarlet Tanager, 27; Northern Cardinal, 157; Rose-breasted Grosbeak, 17; Blue Grosbeak, 2; and Indigo Bunting, 181. Red-winged Blackbird, 69; Eastern Meadowlark, 25; Common Grackle, 95; Brown-headed Cowbird, 39; Orchard Oriole, 7; Baltimore Oriole, 4; House Finch, 28; Red Crossbill, 1; American Goldfinch, 166; and House Sparrow, 128. 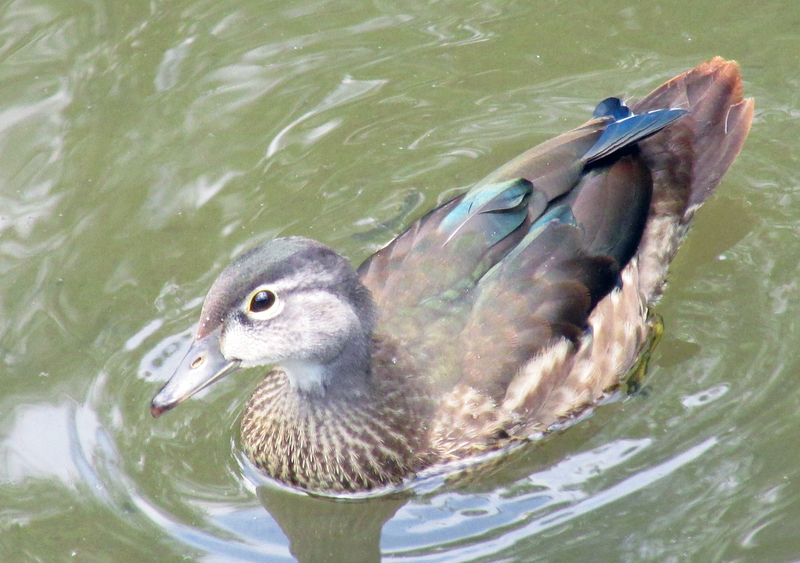 Although waterfowl can be difficult to find in Carter County during the summer months, a total of 11 Wood Ducks were tallied for the Summer Bird Count. All 116 species found on the count are known or suspected to nest in Carter County, except for the Double-crested Cormorant. 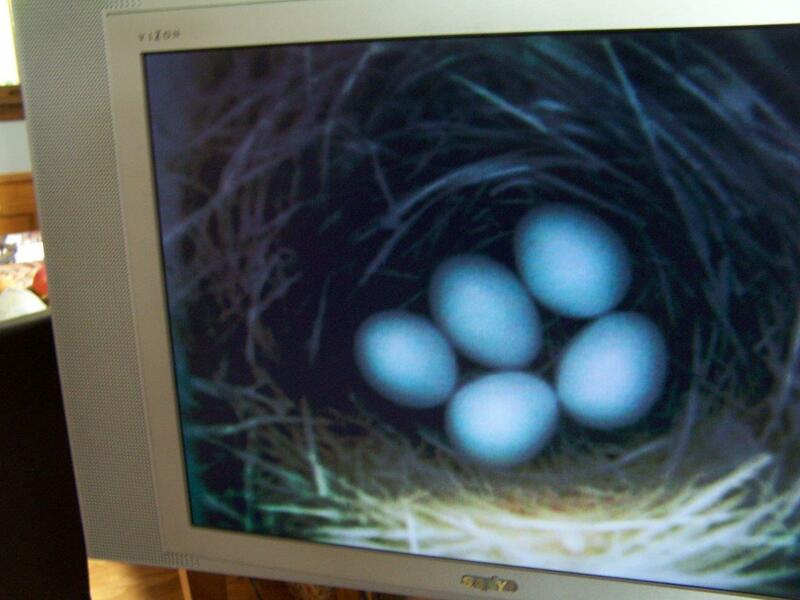 Hampton resident Barbara Lake emailed me to share some photos of a clutch of eggs in one of her bluebird boxes. A clutch of five Eastern Bluebird eggs in a box at the home of Barbara and Jerry Lake in Hampton. She actually has two pairs of Eastern Bluebirds nesting in boxes at her home. She has named the bird Blossom and Max, as well as Aliy and Allen. The latter are named for Iditarod and Yukon Quest musher friends. 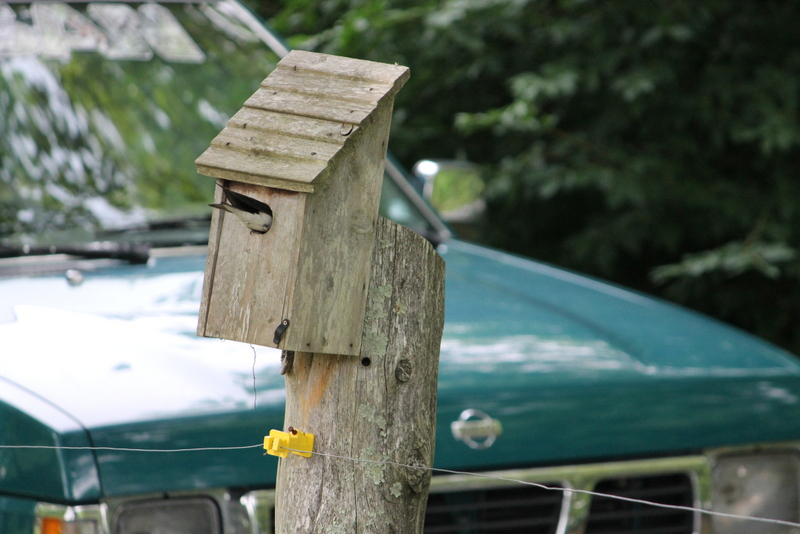 Some of Barbara’s bluebird boxes are equipped with television cameras, which allows her to monitor activity on a television screen in the comfort of her home. Now that it is July, birding sometimes becomes more difficult because of the intense heat, high humidity and other factors. There are still interesting bird observations to make. Many birds are still taking care of young, either in or out of the nest. If you’d like to share an observation, make a comment or ask a question, email me at ahoodedwarbler@aol.com or post a comment here. This entry was posted in Birding, Birds, Carter County Compass, Elizabethton Star, Erwin Record, Summer Bird Counts and tagged Birding, bluebirds, Carter County Summer Bird Count, Hummingbirds, Lee and Lois Herndon Chapter of Tennessee Ornithological Society, Summer birding, Tennessee Audubon Society, Tennessee Ornithological Society on July 6, 2014 by Bryan Stevens.